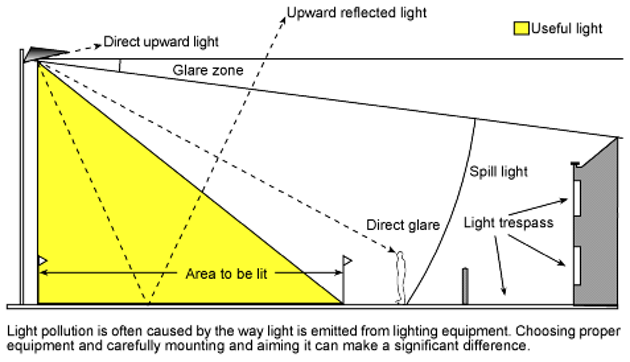 Useful light and light pollution from a typical pole-mounted outdoor luminaire. Note the glare zone beyond the zone of useful light. The LED lights project for the Coastside is still in process and will be discussed at the MCC meeting next Wednesday. While the county seems to be leaning towards the amber colored lights they have not agreed to diffusing covers or shields to prevent overflow to adjacent homes and yards. The proposed solution for the overflow and glare into homes and yards is to hand manufacture and install shields after the fact, when requested, despite availability for factory installation. There will be no diffusing covers to soften the glare. A couple of MCC members support the existing lights. Others do not. Many comments and letters to Don Horsley or on the county comment web page have stated that the existing lights are too bright and glaring. They are noticeably emitting more glare than the existing lights due to the lack of covers. The MCC has informally requested a dimmer sample light be put up and considered as a mitigation for the glare. The county has not responded to this request. The MCC will be discussing a formal letter on this issue. The County is claiming there is little public interest in this issue. Despite the request for public input, letters to DH have not been acknowledged by his office and there is no way of knowing they were received or read. I received no reply to a long letter I sent early this year until I inquired weeks later. While comments made on the County website are on the mcc website, there has been no comprehensive gathering of all public comment. I know several people who wrote directly to Supervisor Horsley and did not comment on the county webpage which required a multistep registration and was problematic. To influence this decision It is critical that we have speakers at the MCC meeting next week at the GSD office. Please come and speak up for dark sky and soft light in our rural community. I personally have a light next to my home and yard that will pollute my night sky views unless it has a shield. The current fixture has a bulb that directs the light away from the property. Anyone else near a fixture will be impacted by this. Also while the County asked for public input, the numerous complaints about the glare have not responded to with an effective solution. Please let me know if you have any questions and whether you will be at the meeting.